One of the things which makes this area so beautiful is the variety in the landscape. 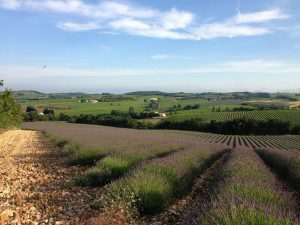 The vines share the hillsides with oak and mediterranean pines, there are fields of wheat, sunflowers and of course lavender. The lavender is starting to flower now and, as you can see from the picture, has just started to take on a blue tinge. Once it’s in full flower the whole field will be a beautiful lavender blue and when the hot sun hits it and the breeze blows the air is scented with lavender. You can see Domaine L’Ancienne École (centre left) in this picture surrounded by our vines and lit up by the early morning sun.